How to approximate a half-cosine curve with bezier paths in SVG? and runs from [x0,y0] (the left-hand control point) to [x1,y1] (the right-hand one). How can I find an acceptable set of coefficients for a good approximation of this function? Bonus question: how is it possible to generalize the formula for, for example, a quarter of cosine? Please note that I don't want to approximate the cosine with a series of interconnected segments, I'd like to calculate a good approximation using a Bezier curve. I tried the solution in comments, but, with those coefficients, the curve seems to end after the second point. After few tries/errors, I found that the correct ratio is K=0.37. + "C" + (x1 + K * (x2 - x1)) + "," + y1 + ","
+ (x2 - K * (x2 - x1)) + "," + y2 + ","
The green line is the real cosine, the black one is the Bezier. Scroll down to see 5 samples. Points are random at each refresh. For the generalization, I suggest to use clipping. Let's assume you want to keep the tangent horizontal on both ends. So naturally the solution is going to be symmetric, and boils down to finding a first control point in horizontal direction. * Find the best cubic Bézier curve approximation of a sine curve. 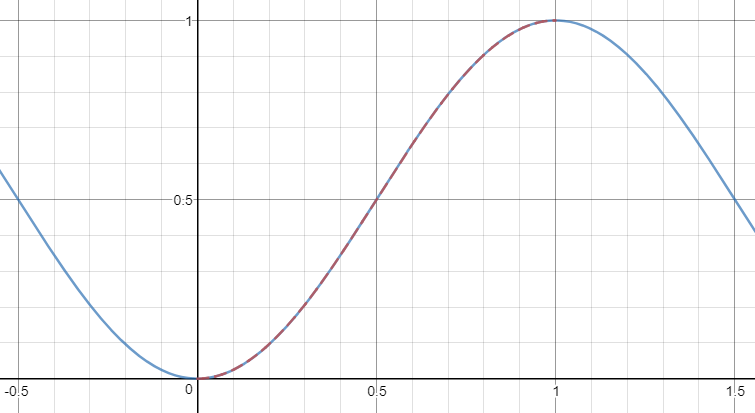 * the shifted sine curve (y = a⋅sin(bx + c) + d) which has its minimum at (0,0) and maximum at (1,1). * This is useful for CSS animation functions. To simplify calculations, I use the normalized sine curve, which passes through (0,0) and (1,1) as its minimal / maximal points. This is also useful for CSS animations. It returns (.3642124232,0)* as the point with the smallest root-mean-square deviation (about 0.00013). * Note that there are rounding errors when doing math with JS, so the value is presumably accurate to no more than 5 digits or so. Because a Bezier curve cannot exactly reconstruct a sinusoidal curve, there are many ways to create an approximation. I am going to assume that our curve starts at the point (0, 0) and ends at (1, 1). A simple way to approach this problem is to construct a Bezier curve B with the control points (K, 0) and ((1 - K), 1) because of the symmetry involved and the desire to keep a horizontal tangent at t=0 and t=1. Then we just need to find a value of K such that the derivative of our Bezier curve matches that of the sinusoidal at t=0.5, i.e., . 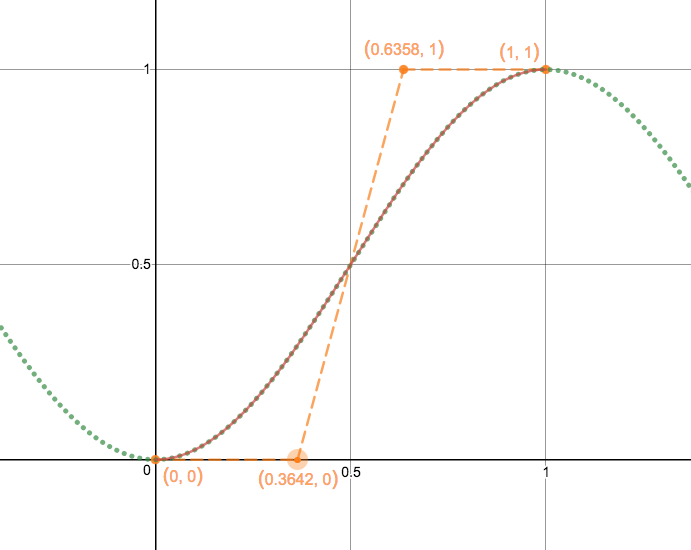 Since the derivative of our Bezier curve is given by , this simplifies to at the point t=0.5. it provides some of the insights required. Not the answer you're looking for? Browse other questions tagged svg graphics trigonometry bezier spline or ask your own question. How to draw sine waves with SVG (+JS)? How do I make a sine that is rotated with an angle in spritekit swift? How can I calculate the area of a bezier curve?